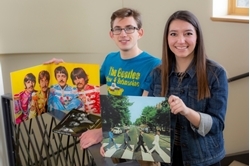 Iowa State students come together to study the Beatles . Beatles Radio: The Beatles, Solos, Covers, Birthdays, News The Fab 4 and More! Jennifer Leptien was the kindergartener singing the Sgt. Pepper’s Lonely Hearts Club Band album word for word. After watching John Lennon’s “Live in New York City” performance, she was the seventh-grader walking the hallways in her army jacket.